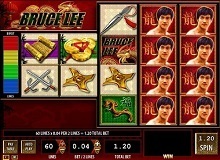 Bruce Lee Slot is a game made by WMS Gaming. This is a company with a big portfolio consisting of high-quality casino games. This particular title is one of the most popular iterations of the slot formula that WMS has made. Most people are aware of Bruce Lee and his influence in the worlds of martial arts and the movie industry. This casino machine is a slot about, well, Bruce Lee. He’s the main character of the game. There isn’t really a coherent storyline behind the play – but we think that the fans of this legendary actor would still enjoy playing this slot. The machine features 60 pay lines, in total. The reel structure is a bit unorthodox. There are two reels with two symbols – and then come three additional reels with 4 symbols each. The design is made because of the special “money burst” feature that some WMS games have. It’s very simple to play Bruce Lee Slot. If you’ve already found a place where you can play Bruce Lee for real money, then things will be very easy. All you need to do is select your bet size and the number of pay lines that you’ll wager your bet on. The lowest bet you can place is 0.01 coin for every 2 pay lines, on 10 different pay lines. This wager would amount to 0.05 coins. The biggest bet that you can place, on the other hand, is 2 coins per 2 pay lines, on all the 60 pay lines. Now the wager would be 60 coins. The game isn’t very complicated when it comes to the rules and symbols at play. You can expect to see the Wild symbol of Bruce Lee’s face. This symbol can take the place of any other symbol – except for the feature symbol. In some cases, the Wild symbol also gets stacked. 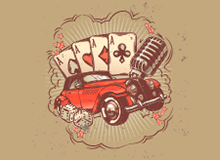 The Scatter symbol is a chest – it will get you to the bonus free spins round. 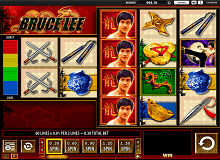 Bruce Lee Slot features some additional symbols like dragon figurines, Ming vases, and golden scrolls among others. There are also the notorious weapons favoured by the actor – nunchucks, ninja stars, and throwing knives. If you get three chests, then you will activate the bonus game. You will get a number of free spins depending on the way you will activate the bonus game. You can get 5-20 free spins in this way. 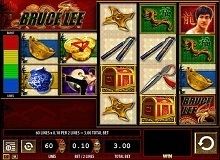 By playing Bruce Lee casino slot online, you will be able to win a lot of money. It’s important to learn how best you can go about this process. The Bruce Lee game is designed to be with low volatility. This means that there won’t be any huge ups and downs in your profits and losses while playing this game. You will have to take inventory of the money that you have available for playing. The fact is that gambling can be highly addictive – you need to be careful. As for the game itself, there really isn’t any way to influence how the game goes. The RTP rate is set at 96.05%. This means that the casino will have an edge of 3.95% over the player – this is still an attractive rate. In order to win, you have to be plain lucky – there is no other way around it. There aren’t any cheats that you can use in order to beat the system. In any case, we recommend that you find a Bruce Lee free version online. You can play Bruce Lee Slot machine online – this will help you get to learn what this slot is all about. This title is a game that will be loved by the people that appreciate simplicity. Though it features a number of different symbols and an unorthodox reel system – this is a pretty simple slot at heart. The low volatility will undoubtedly attract the more risk-averse casino players. We hope that you will come to enjoy playing the Bruce Lee Slot by WMS. It’s not a very flashy or highly innovative slot, but it can still pack a powerful punch.